I know, I'd promised no more fruit flavours, but dinner was underway by the time I was home from work today, and frankly I had kinda been looking forward to this one. 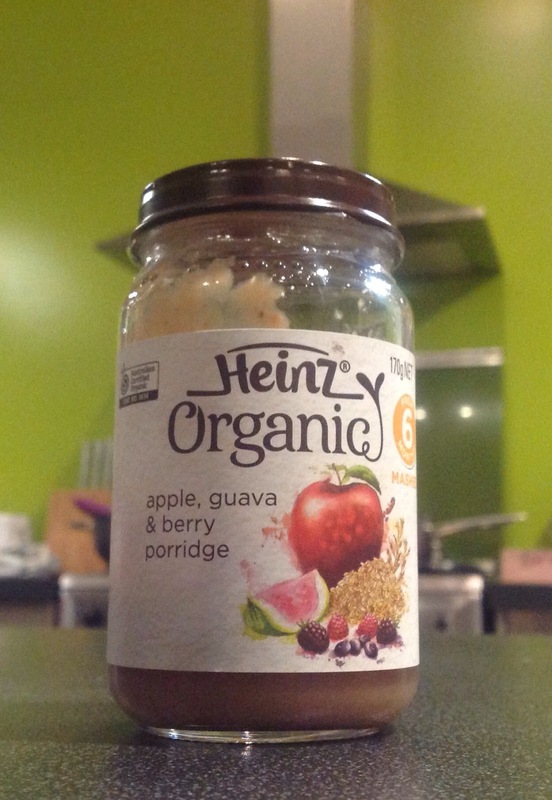 Heinz Organic is advertised on Wattie's website as being like their premium organic range, but TRICKY... Closer inspection of the jar reveals that, actually, this product is made in Australia from local and important ingredients... So, save the planet by eating organic, but destroy it again with baby FOODMILES! Scandalous! It's actually been a couple of days since I last ate a puréed food, my last attempt being the frankly disastrous Wattie's green peas and courgette, so I was eager to get back in. This is the first of several foods in the pantry containing cereals or grains. My only grain experience so far being the totally anonymous quinoa offering last week, I was keen to see if a less wanky, preposterous cereal would make more of an impact. Oats have been described previously as having mysterious cholesterol lowering properties, so surely they're pretty super too? I'm going to call it before eating, the guava is not in this for flavour, but similar to the quinoa, is present as a wanky middle-class enticing status ingredient. I'm not sure I've ever seen a guava in my local supermarket, much less eaten one, but I reckon you could get a similar flavour out of this with an extra 6 percent apple. 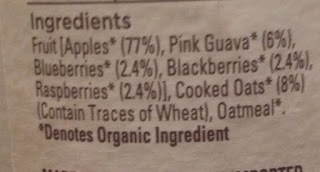 Similarly to Only Organic, Heinz Organic put an asterisk next to each of their ingredients sourced organically. In a point of difference, however, every ingredient in this Heinz Organic product has an asterisk next to it, somewhat ironic given the Only Organic name. More ironic than rain on your wedding day. First impression: This is not a purée, it is labelled as a mash. I think that means it is allowed to have lumps in it. This food is a deep pink in colour. Now, as I said, I'm not a guava expert, and judging by the picture on the jar, this pink MAY JUST be the colour of guava, but I'm sure a similar colour could also have been made using a combination of the apples and raspberries within. Still, a fun looking colour to ingest, and the small lumpy oaty nuggets promised an exciting in-mouth experience was forthcoming. Emily's reaction: As I write this, Emily is doing her best to loudly wake the fish that lies motionless at the bottom of our fish tank. It is surprising, therefor to know that not half an hour ago, she was lunging hingrily at the spoon from which I was attempting to taste this food. This was by some distance the biggest jar of food we had attempted to feed Emily, by the time I got home from work it was mostly empty. I'm unsure whether the guava was apparent to Emily, however. Bouquet: Three elements predominate on the nose. First off, not surprising considering the 77 percent content, apple tones delicately dance their way through the turbinates and towards the olfactory nerve head. These are followed by generous hints of both banana and raspberry, pleasant and sweet, and enticing. I don't know what a guava smells like, I assume it's not present though. Taste test: I had expected the soggy, soft, mushed oat sensation to be unpleasant before tasting, but I was in for a surprise. The nuggets clusters complemented the finally granular texture of the overall food substrate devinely, and proved not offensive at all. It came as something of a shock, considering the heaviness of the bouquet and the content in the ingredients list, that apple was not the predominant taste in this food. Indeed, berry tones took charge upon the buds: black, blue and rasp, with delicate currant flavours pirouetting around the back of the palate. The overall sensation in the mouth was indulgent. Perhaps a slight improvement would be made by adding some morsels of stewed apple or a similar fruit, but it would be too easy to be over critical of this food. 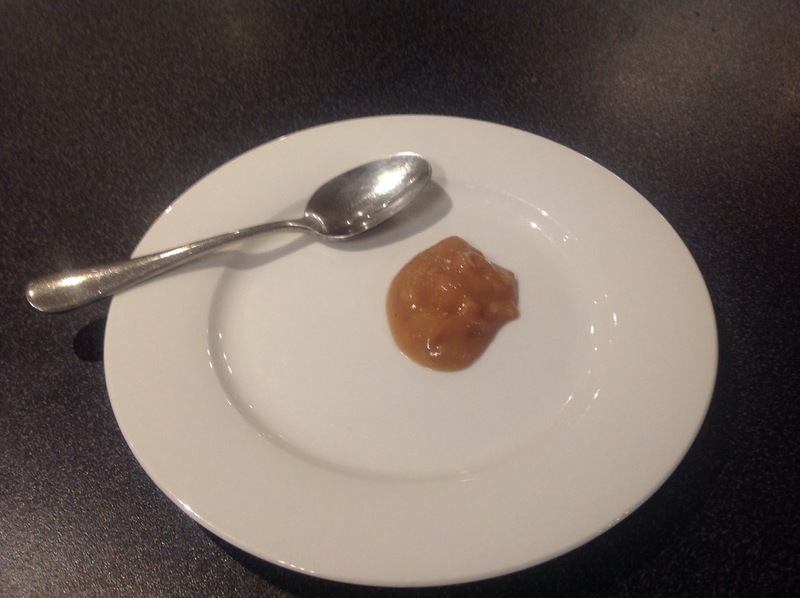 The guava, however, seemed once again absent from the experience. 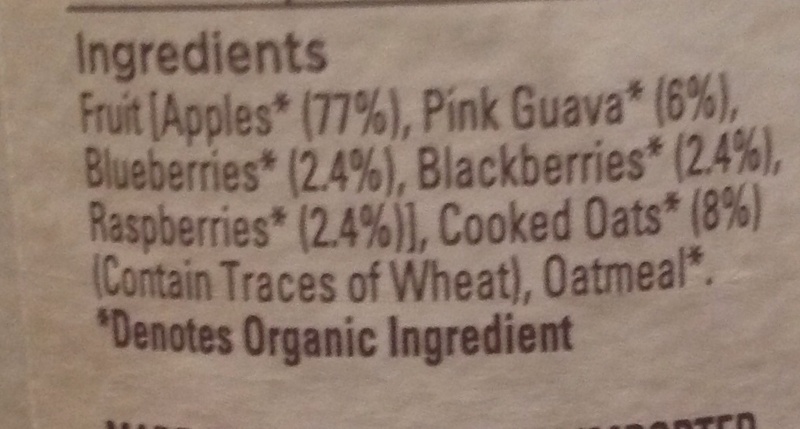 I am beginning to suspect that my belief it is to fruit what quinoa is to grains is confirmed. However, in that case, oats must be to cereals, as the humble apple is to fruit based baby foods. Somewhat ironic. Like finding a thousand knives when all you need is a spoon to eat this delicious offering. Overall: 8/10. Being a predominantly fruit based mash, this was always going to score highly. Perhaps could have scored higher still had it ditched the guava in favour of more berries. Enjoy: Spread on buttered fruit toast, with a cup of strong English breakfast tea.